Colostrum is "a hot supplement in the athletics world," according to Dr. Louise Burke, the Head of Nutrition at the Australian Institute of Sport in Canberra. In fact, many world-class athletes are known to take it regularly. The reason it is receiving so much attention lately is due to the rapidly growing body of clinical evidence that demonstrates how it can support athletic performance. What can athletes expect from colostrum? The IGF-1 in colostrum increases uptake of blood glucose and facilitates the transport of glucose to the muscles, which keeps energy levels up. Together with growth hormones, IGF-1 also slows the rate of protein breakdown (catabolism) that occurs after a vigorous workout. It speeds up protein synthesis, which results in lean muscle mass without an increase in the amount of stored fat. Colostrum improves the assimilation of nutrients, which leads to improved energy levels and performance. Also, the immune factors in colostrum help athletes to minimize their susceptibility to infections while being able to keep up with their training schedules. Recent research shows that bovine colostrum supplementation can improve performance in activities requiring both strength and endurance. A study by Buckley and his research team at the University of South Australia (1999) examined a group of eight elite female rowers. In this study, the women consumed either bovine colostrum (60g/day) or a whey protein powder (placebo). The colostrum ­supplemented group performed significantly greater in terms of distance covered and work performed during a 4-minute maximal rowing effort. Another study by Buckley (2003) compared the effect of bovine colostrum supplementation to whey protein powder on 51 male athletes, and found that colostrum supplementation during training significantly increased peak anaerobic power." A study from the University of Tasmania, Australia (2002) has reported that eight weeks of colostrum supplementation resulted in an improvement in cycling performance. These findings were presented at the Pre-Olympic Sports Medicine Conference in Brisbane (Coombs et al., 2000). Compared to their initial performance eight weeks earlier, the group taking 20 grams of colostrum per day completed the time trial 158 seconds faster whereas the group taking whey protein im proved their performance time by only 37 seconds." Researchers at Numico Research in the Netherlands (2002) confirm that colostrum supplementation improves sport performance better than whey protein. A double-blind, placebo controlled study using 35 elite field hockey players, including players from the Dutch national team, showed that highly trained athletes supplemented with colostrum can achieve enhanced performance. The hockey players taking colostrum improved sprint performance significantly better than the whey group. Colostrum contains the growth factors that help build lean muscle, including insulin-like growth factors (IGF-I & IGF-II) and growth hormone (GH). IGF-I, which is found naturally in colostrum, is the only natural hormone capable of promoting muscle growth by itself. The IGFs in humans and cows are identical, but bovine colostrum actually contains a greater concentration of IGF-I than human colostrum. This fact makes bovine colostrum attractive to bodybuilders, athletes and others seeking to gain muscle mass. According to a study conducted in Finland, IGF-1 induces protein synthesis, which leads to an increase in lean muscle mass without a corresponding rise in adipose (fat) tissue. A study by Dr. Jose Antonio (PhD) of the Sports Science Lab at the University of Delaware in 2001 which compared New Life Solutions colostrum (re-branded as Sovereign Laboratories Colostrum-LD) supplementation to milk whey supplementation found that the colostrum produced a significant increase in bone-free lean body mass (muscle) while the milk whey did not." This study shows these significant results with just 20 grams of colostrum per day (instead of the typical study dose of 60 grams per day). When it comes to fat metabolism, the growth factors in colostrum "shift fuel utilization from carbohydrate to fat. This doesn't mean you can eat more fat. But it does mean that your body will burn more fat, including fat made from the carbohydrate and protein you eat, producing fuel more efficiently", states Steve Schwade, Associate Editor of Muscle & Fitness maqazine. Athletes are faced with a paradox: part of the reason they work out is to be healthy, yet they tend to be more susceptible to infections. After a rigorous workout, the immune system temporarily reduces its production of T-cells and natural killer cells. With frequent workout schedules, some athletes continuously put themselves into an immune-suppressed state, increasing their chances of becoming ill. Colostrum is the only natural healing substance capable of transmitting immunity; it can help reduce an athlete's chances of falling victim to opportunistic pathogens during his or her 'down' time. Strenuous exercise associated with athletic training and competition places a tremendous strain on body systems, including the immune system. Scientists at Loma Linda University in California have done a number of studies in which the effects of extreme exercise on the immune system were examined. 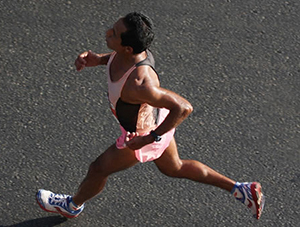 One study of experienced marathon runners, conducted by Dr. David Nieman (DrPH) in 1989, found significant changes in white blood cell counts after a 3 hour run, most of which returned to normal levels after 21 hours. Another study done by Dr. Lee Berk (DrPH) in 1990 found that marathon runners show a marked decrease in the activity of natural killer (NK) cells in the hours after a race. Natural killer cells are an integral part of the body's immune defenses, seeking out and killing foreign or infected cells in a nonspecific manner. This decrease in NK activity indicates an increased susceptibility to infection following strenuous exercise. These results were confirmed in another study by Dr. Sparling and his colleagues at the Georgia Institute of Technology in Atlanta in 1993 which showed that marathon runners do indeed have an increased susceptibility to infectious disease when they are training or racing. An athlete's susceptibility to infectious disease can be reduced through proper nutrition (including colostrum supplementation), adequate sleep, sufficient recovery between workouts and avoidance of exposure to sick people during periods of heavy training and competition. Dr. Edmund Burke (PhD) from the University of Colorado-Colorado Springs explains in an article published in Nutrition Science News in May 1996 that "colostrum and its components help decrease recovery time and boost immune functioning in athletes. Colostrum contains growth hormones, specifically insulin-like growth factor-1 (IGF-1), as well as epidermal growth factor (EGF), platelet-derived growth factor (PDGF) and transforming growth factor beta (TGF-B). These growth factors help muscle recovery and development in athletes." He goes on to say that "colostrum also can help with 'leaky gut syndrome', a condition found to some extent in nearly all individuals in which the gut is permeable, to some degree, to pathogens and other macromolecules." This is important for athletes in that "sealing" the gut with colostrum supplementation would increase energy levels and smooth out performance, especially for those athletes who suffer from irritable bowel syndrome as a result of incomplete digestion due to protein supplementation. A preliminary study involving scholarship rowers in Australia not only showed that the colostrum group had a greater improvement in work done than the whey group (placebo), but also showed that athletes who consumed colostrum experienced less viral and bacterial illness than those supplemented with whey protein. Anecdotal reports suggest that bovine colostrum may prevent upper respiratory tract infection (URTI). There is scant evidence to support such claims, although salivary IgA protects against URTI, and it was recently shown that bovine colostrum increases salivary IgA. In a recent study (2003) conducted by Australian researchers Brinkworth and Buckley, bovine colostrum was shown to enhance resistance to the development of symptoms of URTI. Recent studies by Drs. Jon Buckley (PhD) at the University of South Australia, Jeff Coombes (PhD) of the University of Queensland, Australia, and Z. Hofman (PhD) of Numico Research in the Netherlands have tracked the effect of colostrum on athletic performance. These studies showed that colostrum supplementation results in much shorter recovery times following maximal exercise, as well as significantly increased anaerobic power. Paradoxically these studies found no significant increases in plasma IGF-1. Researchers at the Centre for Research in Education and Sports Science in Adelaide, Australia demonstrate that colostrum can improve recovery." After eight weeks of colostrum supplementation, performance during a second bout of exercise may be improved by as much as 5.2%, possibly due to an enhancement of recovery. The healing of an athletic injury, whether it involves bones, muscles, tendons, ligaments or other tissue, is influenced by numerous growth factors and cytokines which are naturally present in colostrum. Growth factors represent one of the most important of the molecular families involved in healing. Colostrum is the only natural source of insulin-like growth factor-1 (IGF-1), which can improve muscle regeneration in injured muscles and promote tendon healing. Skeletal muscle is able to repair itself through regeneration, however, an injured muscle often does not fully recover its strength because the process is hindered. IGF-1 can improve muscle healing and regeneration. IGF-1 has been shown to be highly expressed during the early inflammatory phase, and appears to aid in the proliferation and migration of fibroblasts and to subsequently increase collagen production." Another growth factor of colostrum, platelet-derived growth factor (PDGF) helps to stimulate the production of other growth factors, including IGF-1. Other growth factors in colostrum that help in the healing of injuries include growth hormone (GH) shown to accelerate bone regeneration, transforming growth factors - a and b (TGFa and TGFb) shown to regulate cellular migration and proliferation, and fibroblast growth factor (FGF) shown to be a powerful stimulator of angiogenesis and a regulator of cellular migration and proliferation. Cytokines also show great potentials in future clinical application, as they have been shown to accelerate tendon repair. Among many performance-enhancing compounds that colostrum contains is a substance called insulin-like growth factor 1 (IGF-1), which, combined with regular exercise, is believed to help stimulate muscle growth and repair. Dr. Edmond Burke explains that while IGF-1 is banned by the International Olympic Committee (IOC) when taken in synthetic form, IGF-1 that occurs naturally in colostrum is not a proscribed substance. When athletes were given bovine colostrum supplementation during training, it was reported by Dr. Antti Mero (PhD) et al of the University of Jyvaskyla in Finland that serum IGF-1 levels increased even though the IGF-1 ingested with the colostrum was not absorbed but rather digested in the gut.s A study in the Netherlands supports that daily supplementation (60 g/day) of bovine colostrum for 4 weeks does not change blood IGF-I or IGF binding protein-3 levels, and thus does not elicit positive results on drug tests. This issue was recently the focus of controversy when the International Olympic committee became concerned with colostrum use by athletes to boost performance. However, since none of the ingested IGF-1 is actually absorbed by the body, the Committee did not ban colostrum supplementation. Most important is the natural delivery system provided by the mammary gland to ensure that colostrum reaches the portion of the gastrointestinal system where it can do the most good. When colostrum is secreted by mammary cells, it does so by what is called apocrine secretion. This means that colostrum is collected in a globule in the mammary cell that is surrounded by cell membrane. When the globule is released into the mammary duct, the cell membrane remains around the colostrum, protecting it until it reaches the intestine where it can be absorbed by the body. Dried, freeze-dried, and defatted colostrum products lose this protective membrane, leading to degradation of colostral proteins in the stomach. Colostrum which has the membrane phospholipids reconstituted, however, retains the protective membrane and is much more effective.Bovine colostrum supplements that utilize unique LD Liposomal Delivery (LD) technology provide a bio-identical delivery system in which the membrane phospholipids are reconstituted to protect the colostrum and enhance delivery for all nutrients. This enhanced delivery helps to shorten catabolism (the breaking down of muscle) and get the body back into an anabolic state more quickly after a workout. These representative studies indicate that colostrum can provide support for any athlete in maintaining his or her health during strenuous exercise as well as improving performance, body conditioning, injury repair, and recovery in response to the stress that heavy exercise places on the body.